Animating the 21st Century DV Fanatics film open. In last week's blog, Dissecting the Video: 20th Century Fox Open (Pt 1), we discussed using Adobe After Effects to build the different 3D objects, that we will use to create a film open like the one used by 20th Century Fox. This week we'll put those 3D elements together and add the animations of the sweeping spotlights. In the first comp we will build this week, I've combined the 3D_build_21_century comp with 2 layers of the 3D_build_light_tower comp in a new comp named 3D_build_centuryscape. This will allow me to treat all three objects as a single object more easily than if I had established a parent/child relationship. 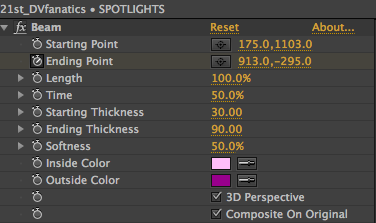 The layers of the 3D_build_centuryscape comp in the After Effects timeline. For the layer of 3D_build_light_tower that will be to the left of 3D_build_21_century, I have reduced its SCALE to 20%, set its Y ROTATION to -90 degrees and moved it far enough to the left so that it doesn't obstruct 3D_build_21_century. The 3D_build_light_tower for the right side of this comp has a reduced SCALE of 15% and has been moved to the right enough so that it can be moved back in Z space. We don't want it as far forward as the face of 3D_build_21_century. The layers of the 21st_DVfanatics comp in the After Effects timeline. 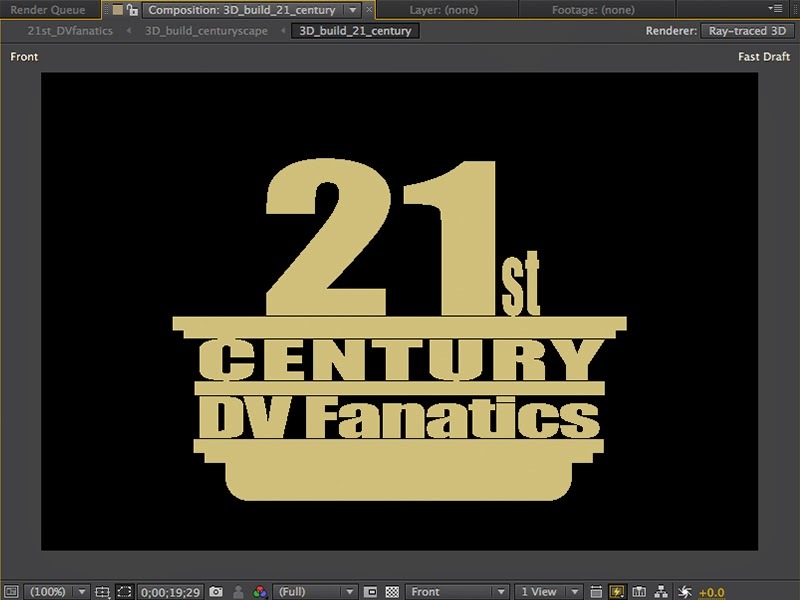 The final sequence is named 21st_DVfanatics. This is the sequence that we will render for our final output. Here are the layers in this sequence starting from the bottom up. I started out by adding the sky_image.jpg layer which slowly zooms in to give the clouds some motion. This is done by starting with a SCALE set to 74% and ending with a SCALE of 100%. The effects settings for Spotlights. Next I've added an ADJUSTMENT LAYER named SPOTLIGHTS. This contains the 3 spotlights that are behind the 3D_build_centuryscape layer. The SPOTLIGHTS are animated by keyframing the ENDING POINT of the BEAM effects. The 3D_build_centuryscape layer is next. Make sure Collapse Transformations is enabled. The 3D_build_foreground layer is on top of the 3D_build_centuryscape. Make sure Collapse Transformations is enabled on this layer as well. The next 3 layers are the lights for the 3D layers. I have 2 POINT lights for the 3D_build_centuryscape and the 3D_build_foreground layers. An AMBIENT light to is used to fill in some of the shadows. The ADJUSTMENT LAYER named SPOTLIGHTS on the second from the top layer has the two spotlights that come from the light towers (3D_build_light_tower) we built. These require a mask so that they don't cover the light fixture at the top of the light tower. The topmost layer is an ADJUSTMENT LAYER with a ADD GRAIN filter. This gives the comp a film look and better blends the clean 3D objects to the grainier cloud image in the background. Those are the basics for creating a 20th Century Fox open. I've assumed a basic working knowledge of Adobe After Effects. For more detail, the After Effects project and its source material can be found at this link - After Effects 21st Century DV Fanatics Project. Here is what the rendered Adobe After Effects sequence should look like.